Our mission behind Stage for Change is to create awareness around addiction. We can create a community that is supportive. A supportive community can challenge stigma and work together to reduce it. When we start to challenge and reduce stigma, conversation begins. 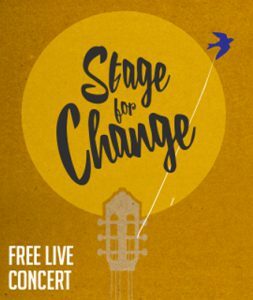 You can view the documentary STAGE FOR CHANGE: A VISUAL HISTORY to see the evolution of this popular and growing community event where we tell our story! We’ve planned some fabulous events over the years, including live bands, poetry slam, magic show, shared stories on recovery, as well as supporting those thinking about making a change. And there are plans for more to come! When we think and act alone we can feel powerless. Problems associated with substance use or gambling or an addiction may seem insurmountable. When we positively come together as a community to understand challenges and support those starting the journey of recovery, we start momentum for positive change. Change does feel better when we know we are supported. If you are struggling with addictions or know someone who is, just start talking – someone will be there for you – a journey of recovery can start at any time. Thank you to everyone in our communities – it is possible to come together and start to make change.